Kick back and relax with your other favorite pastime. You played 18 holes today, don't you deserve to relax? 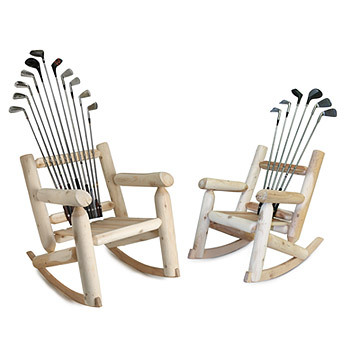 Perfect the 19th hole with a sturdy rocker, handmade from reclaimed golf clubs and unfinished Canadian white cedar. Handmade by Michael Bellino in Massachusetts. Available in Adult and Child size. Sold separately. Bellino lets wood to undergo a natural finishing process called "checking," which creates naturally-occurring cracks that do not compromise the integrity of the wood. Cover if left outside. Unfinished cedar will patina and weather if left out in the elements, which is the artist's intention. If you prefer to keep the chair as is, treat it with a polyurethane finish or wood stain. Clubs will be slightly weathered due to use. Some assembly required. Adult Chair: 26" W x 33" D x 47" H (from floor to tallest club). Child chair: 19" W x 29" D x 37" H.
Unfinished cedar will patina and weather if left out in the elements, which is the artist's intention. If you prefer to keep the chair as is, treat it with a polyurethane finish or wood stain. Adult Chair: 350 lb capacity. Child Chair: 175lb capacity. Some assembly required. Cover if left outside. This chair was beautiful. Just as pictured if not better. It was a wedding present for two avid golfers and they both adored it. [...] customer service at uncommon goods was AMAZING! very courteous and friendly and took care of the matter immediately. New chair is en route!